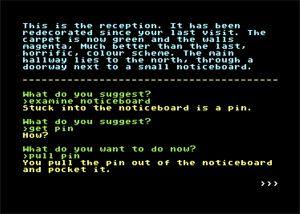 Microfair Madness was a three-part text adventure game initially produced for the ZX Spectrum and later ported to Amstrad CP/M machines. A third-party produced Commodore 64 version was planned (and even mentioned in Commodore Force/Zzap 64) but never completed. 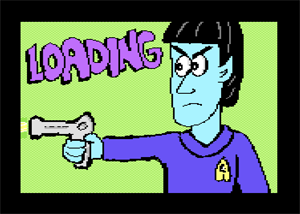 This new Commodore 64 version, produced in 2019, takes the 48K Spectrum game and brings it to the C64 via the magic of Stefan Vogt's ANTUR transcompiler and the power of Infinite Imagination's DAAD. DAAD is a descendant of Gilsoft's the Quill and the PAW, originally created exclusively for the use of Spanish adventure company Aventuras A.D, but now thanks to their generosity it is available for the general retro adventure community to use. 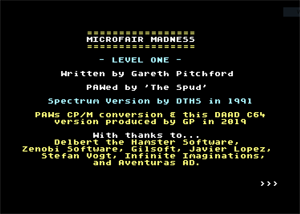 DAAD's compiler-based system allows authors to target multiple machines; the C64, ZX Spectrum, Amstrad CPC, MSX, PCW, Atari ST, Amiga, and IBM PC (DOS). 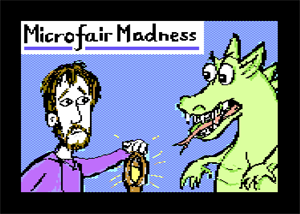 You can read more about the original version of Microfair Madness by clicking here.